President A. P. J. Abdul Kalam said here today that diversification of agriculture alone was the key to prosperity of farmers in Haryana. Expressing concern over the poor quality of life of people, both in rural and urban areas, President A. P. J. Abdul Kalam said here today that the GDP alone should not be taken as the index of the nation's prosperity. If the views of the followers of Dera Sacha Sauda are anything to go by, the peace process was hampered due to the premature statements made by Swami Agnivesh. Passersby were shocked to see a woman walking with her right hand and leg in chains. Rajjo Bai, a mother of five, was spotted in the Bighar Road area here. When somebody enquired about the chains, she said, “Aurat hoon, is liye mujhe janjeeron se bandha gaya hai” (I am a woman, so I have been tied in chains). There was a huge lock near her foot to keep the chains together. The Indian National Lok Dal secretary general and Rajya Sabha MP Ajay Chautala said on Thursday that his party would not allow opening of Reliance Fresh or grocery stores of big companies in Haryana as this would ruin small traders of the state. Magsaysay Award winner Rajinder Singh has charged the Delhi state government with creating environmental nuisance by allowing construction on 10,000 hectares on the banks of the Yamuna. Last night’s vandalism at the Haryana government’s most prestigious project, Deen Bandhu Chhotu Ram Thermal (600 MW) site, here, has left the government, Haryana Power Generation Corporation (HPGC) and Reliance Energy Limited (REL) officials worried. Haryana Chief Minister Bhupinder Singh Hooda has cleared a proposal to give ex-gratia relief to families of 44 paramilitary personnel from Haryana, who were killed while fighting against insurgents in various parts of India. Schoolchildren today joined the controversy over the auction of prime land to the Jindals for setting up a school in the Mill gate area here. Three persons were killed in a road accident involving a truck, a tempo and a motorcycle in Bahadurgarh town of the district last night. The Kosli police arrested four persons — Naresh Yadav, Krishan Kumar Yadav, Krishan K Yadav and Mahhender — on the charge of kidnapping three youths last evening. In a case of assault on journalist of Kosli, Jagdish Yadav, in November, 1999, judicial magistrate, Kosli, has sentenced three persons. Sakshi Khetrapal of Sacred Heart Convent School, Jagadhri, has topped the CBSE Class XII examination (Commerce) in the district with 94.2 per cent marks. Sundri Devi (94), mother of Dhanendra Kumar, former IAS officer of the Haryana cadre and executive director of the World Bank, died after a prolonged illness at Ghaziabad today. Deputy commissioner R.P. Bharadwaj yesterday directed executive officer of the Municipal Council, Ambala Sadar, to remove encroachments from the Sadar area. District and Sessions judge Ambala B.M. Bedi yesterday acquitted a woman in a murder case for the want of sufficient evidence. An undertrial prisoner lodged in Ambala jail attempted to escape from the police custody today. Two persons were injured, one of them seriously, following a clash at a liquor vend in Dhurala village late last night. Sangharsh Vahini chief Hira Lal Yadav today announced his decision to join the Indian National Lok Dal (INLD). A meeting of the district unit of the Bahujan Samaj Party (BSP) was held under the presidentship of Dr Balbir Singh yesterday. A blood donation camp was organised by the Nem Chand Jain Memorial Foundation at SD College, Ambala Cantt, today. Addressing a gathering, he said the people of Haryana had the good fortune of living in a state which provided food to the entire country. Over the years, Haryana had prospered. However, if the state had to go further, its peasantry must play an important role. Apparently referring to the wheat-paddy rotation, he said farmers should diversify into other crops and take up other farm-related activities. If the farmers prospered, the state would also prosper in turn, the President added. On his arrival in the village, Dr Kalam was received by Congress MP from Rohtak Deepender Hooda and other senior government officers. He was first taken to the Herbal Park where he planted a sapling. Next, he visited the Veterinary Hospital. The President’s entourage then headed to the Government Senior Secondary School where he viewed a presentation on the Edusat networking system which has been recently installed in all government schools. Dr Kalam met with a group of 800 schoolchildren. Six hundred of them belonged to this school while the other 200 were drawn from different schools of Bhiwani district. He recited the first three lines of a poem he has written. It said, “Dreams, dreams, dreams; dreams transform into thoughts; thoughts lead to action”. Earlier, while talking to villagers, he paid tributes to the late freedom fighter Pandit Neki Ram Sharma, who hailed from this village. He said he was happy to note that the village was being developed into a model village. Regretting that the economic growth was not fully reflected in the quality of life of a large number of people, Dr Kalam proposed a three-point National Prosperity Index (NPI) to measure the development of the nation. 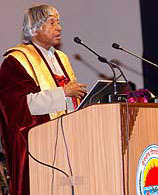 Dr Kalam was speaking at a special convocation of Kurukshetra University, where honorary doctorate degrees were conferred upon Chief Justice of India K.G. Balakrishnan, Law Minister Hans Raj Bhardwaj and the alone living member of the Constituent Assembly, Ch. Ranbir Singh. He said the improvement in quality of life of the people, particularly those living below the poverty line, a righteous way of life, social equality, quality education and healthcare, adequate employment potential and a conflict-free harmonious society, too, should be taken as indices of the nation's prosperity. The President also gave a 10-year mission to Haryana to double the per capita income in five years; uplifting the 14 per cent people below poverty line to near zero before 2017. Earlier, Dr Kalam also unveiled a statue of former President Rajendra Prasad on the university campus after he had visited the Brahmasarovar and the Jyotisar. He appealed to the fresh medical graduates and postgraduates to visit villages on a regular basis and treat patients at the minimum cost. These views were expressed by the President in a convocation address at Pt B.D.Sharma Post-Graduate Institute of Medical Science (PGIMS) here today. He also presented medals to the best graduates of MBBS and BDS courses and also released a souvenir brought out by the PGIMS. As many as 820 degrees, besides 65 medals, were awarded at the function. Regarding the Akal Takht edict of vacating the dera in Punjab, he said it was the responsibility of the Punjab government to protect the deras and maintain law and order. Swami Agnivesh is heading a team of religious leaders meant to solve the dispute amicably. However, the followers’ fax messages and phone calls reportedly received at the dera express regret that the religious leader told the media that the dera chief would tender an apology. The messages reportedly also state that no apology should be issued on behalf of the dera chief. It was learnt that after holding a meeting today, the high-level committee of the dera office-bearers reportedly decided to keep the process of finding a solution on hold and also terminated the communication with the religious leaders for now. A resident of Barseen village, near here, Rajjo Bai is in her early thirties. Her husband Sher Singh Saini, a labourer, had reportedly tied her in chains before leaving for work. Rajjo Bai said she was on her to way to her in-laws’ house in Harnam Colony and when this correspondent tried to ask her in-laws about the ill treatment meted out to the woman, they got enraged and refused to make any comment. However, their neighbours said Rajjo Bai’s in-laws had stated that they had to keep Rajjo Bai in chains as she was mentally challenged. Interestingly, the woman came walking to her in-laws’ house, which is 8 km from her house, on her own and immediately covered her face on seeing her father-in-law. Another neighbour said Rajjo Bai's husband was suspicious about his wife’s character and hence chained her while leaving for work. However, appallingly, though Rajjo Bai crossed at least two police posts and many government offices on her way, nobody came to rescue her from the chained existence. Talking to mediapersons here late last evening, Chautala said stores of Reliance Fresh were affecting the business of lakhs of vegetable and fruit vendors all over the country and the INLD would not allow this to happen in Haryana. The INLD leader, who had come to the town to address a meeting of party workers, blamed the Dera Sacha Sauda chief Gurmeet Ram Rahim Singh for the impasse. He said when everyone was asking the Dera chief to apologise for his act of imitating the Sikh guru, he should immediately do so in the interest of the peace and harmony. He said though the present crisis was not linked with the role played by the dera in the recent Punjab elections, the dera chief must realise that religious leaders should not interfere in politics. Earlier, addressing party workers, Ajay Singh alleged that the UPA government had been working to the against the poor and downtrodden. He said the inflation was high and commodities of daily use had gone out of reach of the common man. The Congress had come to power in Haryana on tall promises but failed to fulfil any of those. The INLD leader said the law and order in the state was at the lowest ebb and people were not safe today. He said the people of Haryana were fed up with the Congress rule and were waiting for an opportunity to dislodge it. He took a dig at former Chief Minister Bhajan Lal and his MP son Kuldeep Bishnoi saying that before asking their supporters to resign from the party they should first resign themselves. The INLD MLA Gian Chand Odh, former MLAs Swatantar Bala Chaudhary and Nishan Singh and INLD leaders Kuljeet Singh, Ram Raj Mehta and Atam Parkash Batra also addressed the party workers. Talking to The Tribune here today, he, who is also known as ``waterman'', said in the name of coming Commonwealth Games, the state government was polluting the Yamuna. He said owing to the massive construction, the fragile ecological surroundings of the Yamuna would be severely affected. He blamed the poor vision behind the complete failure of Yamuna and Ganga Action Plans. He was here on his “Yamuna Satyagrah Yatra'', a mission to launch an awareness drive among slum dwellers and villagers settled on the banks of the Yamuna. He has planned to rope in the common man to protect the river. He has pledged not to take any funds from the government to pursue the mission. He stressed that plantation of peepal, kareel, bargad and wooler were most suitable to protect the catchment areas of the Yamuna. These plantations would further help the river in recharging the water level. Known for his remarkable work by building water-harvesting structures in the arid regions of Rajasthan, Singh had built scores of check dams, or johads, to collect rainwater in villages having drought like situation. They apprehend that the project may now miss the deadline as five vital control panels of the first 300 MW units, to be commissioned in November, were damaged in the fire. REL contacted the company for information regarding costs and time required for the manufacturing and transportation of the panels. An REL spokesman told The Tribune that the project was running ahead of schedule and it may now be delayed as imported equipment was damaged. He also said additional security would be provided at the site and administration would be setting up a police picket along the plan. The Haryana government has emphasized that the power situation would improve once the first unit is commissioned. HPGC chief engineer O.P. Manchanda said it was premature to comment if the project would miss the deadline. “Last night’s incident was unforeseen and unfortunate and senior officials have been informed about it. Haryana government is providing all help,” he said. “We will have to place special orders of the control panels and as of today, we can’t say how much time the China-based company will take,” said Major Surinder Sheoran (retd), plant’s administrative head. A mob of more than 300 villagers had entered the plant’s compound and set afire several equipment and vehicles. The mob had also tried to storm into the main office but the arrival of police forced them to flee. The incident took place after the death of a resident of Ratanpura village in an accident involving a truck. Meanwhile, the police have not registered a case against those who ransacked and caused fire at the thermal plant. However, a case has been registered against the truck driver. The state government, headed by Om Prakash Chautala, had introduced the system of giving Rs 10 lakh as ex-gratia grant to families of defence personnel killed in the Kargil war. But he had discontinued the policy after winning elections in 2000. The Congress government, after coming to power in the state in March, 2005, again introduced the policy of giving ex-gratia grant to families of central paramilitary personnel. While Rs 2.5 lakh is given by the state government to the families of personnel killed in engagements, compensations are also given to injured soldiers depend on the seriousness of the injury suffered by him. Between June 15, 2001, when the policy of giving compensation to central paramilitary personnel was discontinued, and March 4, 2005, when the policy was reintroduced, 44 jawans from Haryana had died in action. These jawans did not come under the ambit of the 2005 policy while they were also left out from the politically motivated policy introduced by Chautala earlier. The families of these martyrs urged the Chief Minister to give them the Rs 2.5 lakh compensation and the CM agreed to their demand. Hooda recently gave his go-ahead to the proposal. The government has now asked its finance department to release the required funds so that the families of the 44 martyrs can be given the ex-gratia amount. Hundreds of schoolchildren took out “prabhat pheris” in the area, carrying placards demanding that the land should stay with the Jindal family for setting up a school. They said they did not want a fish and fodder market on the land. President of the Baba Danasher Mandir Samiti Om Parkash Gujjar administered an oath to these children to carry on their struggle till the land was given for establishing a school. The Jindal family had purchased the land in open auction last month to set up a school in memory of Om Parkash Jindal, Power Minister, who died in a helicopter crash two years ago. The family has already developed a big park in the area at a cost of several crores. The residents are now backing the family in the wake of criticism from opposition parties. The Indian National Lok Dal had alleged that the land was worth Rs 500 crore. The INLD had submitted a memorandum to the Governor in this regard. Sources said a truck coming from Delhi collided head on with a tempo. After the collision, the tempo overturned and two persons, who were riding a motorcycle, came under the tempo while trying to overtake it. The motorcycle riders were identified as Sunil, a resident of Rajasthan and Ramratan, a resident of Bihar. Tempo driver Zile Singh was also killed. With the arrest, the police also managed to free the three abducted youths — Sanjay Chauhan, Pawan Chauhan and Adesh. Naresh Yadav and Krishan Kumar Yadav are residents of Kanwali village while Krishan Kumar Yadav (son of Matu Ram Yadav) and Mahhender are residents of Nangal Bhagwanpur village. Police sources said the kidnappers picked up Sanjay and Pawan from near Gothra Tappa Dahina village while Adesh was forcibly whisked away from the Nangal Bhagwanpur village. Earlier, a case of kidnapping was registered on a complaint filed by Adesh’s father Babu Lal. The trio — Ram Pat, then food and supplies inspector of Kosli, Sangeet Sharma, a kerosene distributor of Nahar village, and Gordhan Das, a depot holder of Sudhrana village — has been awarded imprisonment for 18 months. Besides, the judge has also imposed a fine of Rs 1,000 on each of the three convicts. When Jagdish Yadav’s report, regarding alleged bungling in the distribution of kerosene appeared in a Hindi daily in November, 1999, it infuriated the trio, who on November 30, 1999, raided his office, thrashed him severely. Swati Garg of Sprinfields Public School has topped the district in the science stream (Medical) by scoring 93.3 per cent, while Virender Kataria of SD Model School has topped the non-medical stream with 93.4 per cent. Mansi Sethi and Ashish of SD Public School were second in the district in medical and non-medical streams, respectively, scoring 92.4 per cent each. Vaibhav (90.4 pc) stood second in commerce stream. Arohi Aggarwal (91.2 pc) and Abhinav Ghai (92.4 pc) were toppers in Mukand Lal National Public School. Jahaaraha (92.2 pc), Vivek Garg (92 pc), Mayank Sharma (91 pc), Alisha Gupta (91.6 pc) and Sonam Chawla (90 pc) of Swami Vivekananda Public School were toppers in their schools. She is survived by three sons and three daughters. One of her sons-in-law is Justice L.N. Mittal of the Punjab and Haryana High Court. The funeral will take place in Ghaziabad tomorrow. Students of different schools here have done well in the CBSE Class XII examination. MD DAV Public Senior Secondary, Ambala City, principal Reena Nagrath said Saurav Jain of commerce stream has topped by securing 95.2 per cent marks. Himani Gupta scored 92 per cent while Nikita Aggarwal got 90.6 per cent. In non-medical, Gaurav Bhatia got 93.2 per cent marks, Vasudha and Tarunpreet scored 92 per cent marks each while Rashmi Kumar and Anhita Gulati got 91.8 per cent marks. In medical stream, Sahil Gupta and Harvinder Kaur secured 90 per cent marks each. Sumit Kansal of Convent of Jesus and Mary, Ambala Cantt, got 94.2 per cent marks (commerce). Dewan Harikrishna Das SD Public School principal K.L. Nagpal said Neha Goel of non-medical got 97 per cent marks while Aakshi got 93.2 per cent marks in commerce. He said seven students secured 90 per cent and more and six students secured 100 marks in Mathematics. In SA Jain Senior Model School, Ambala City, Sanuj Bhalla has secured 94 per cent marks while Vineet Garg got 92 per cent marks (non-medical). Abhi Chabra of medical stream got 88 per cent marks. Bharadwaj also said stress had to be on the cleanliness drive. He said he would personally assess the works carried out by the council to clear encroachments and clean drains. The DC said on a previous occasion, he had directed that the encroachments should be cleared, but the effort was not satisfactory. He stated that the temporary encroachments below the flyover, near the main bus stand, should also be cleared. He said all drains must be cleaned before the onset of monsoon season. The alleged accused, Asha, is a resident of Ambala cantonment. Man Singh Kakran appeared as a defence counsel. According to prosecution, on August 12, 2003 Sauarbh, son of Chaman Lal, was kidnapped while he was playing outside his house. The police registered a case of kidnapping against Kunal, a tenant of Chaman. During interrogation, Kunal admitted that he had murdered Saurabh and her aunt Aasha had instigated him to do so. The police also recovered the body of Saurabh kept in gunny bag. Later, the police registered a case under Sections 302 and 364A against Kunal and Aasha. Since Kunal was minor his case was referred to juvenile court, which is still pending there. The counsel of Aasha pleaded that her name did not exist in the FIR and she was falsely implicated in the case. The prosecution produced 18 witnesses in the court. After hearing the arguments of both side the Judge ordered the acquittal of Aasha. He was being brought to a local court by the police. According to the information, Jambu, a resident of Ambala city, was arrested on charge of snatching chain of a woman. The police brought him to a local court this afternoon. He fled when he was being taken in a vehicle. The police raised an alarm and after few minutes he was caught in the court complex. A case has been registered in this regard. Trouble had been brewing for the past few days over the opening of liquor sub-vend in the village. Last night, a group of youths allegedly demolished the liquor vend leading to a clash. A few shots were also fired in the air. In the meantime, Saha police station was informed and a police team rushed to the village. The assailants fled the scene. However, six persons were nabbed from the fields. An FIR has been registered. Talking to the mediapersons here today, Yadav said he would be joining the INLD at a function on May 27. He said over the last two and a half years he had been actively raising civic issues. "We have strongly protested over power cuts, NOC issue and closure of registry as it has directly affected the common people," he said. Yadav said policies of the INLD appealed to him. “The INLD leaders are concerned about the common people and they want overall development of the state,” he said. Among others, Vikas Gupta, Ramkesh Gorkha, Anil Rana, Rajiv Singla, Maya Ram, Om Prakash Garnala and Hakam Singh were present. Dr Balbir Singh said the party had started its work in Haryana on the pattern of Uttar Pradesh. He said a large number of persons had evinced keen interest joining the BSP. He said they would organise an “all religions meet” at Kingfisher complex on June 3. Gupta said party general secretary Man Singh Manhera would preside over the meeting. He said a rally would be held in Lallana village in Naggal on June 3 in which a number of persons were expected to join the party. He said after success in Uttar Pradesh the party was determined to form the government at the Centre. The camp was inaugurated by deputy commissioner R.P. Bharadwaj. Project coordinator Lalit Jain said as many as 175 units of blood were collected in the camp. It was supervised by doctors from PGI, Chandigarh. Among others, Dr Anil Jain, Naveen Jain, Praveen Jain and Neeraj Jain were present.